The two archrivals provide numerous thrills in a match where a surprising amount of promising depth was showcased. 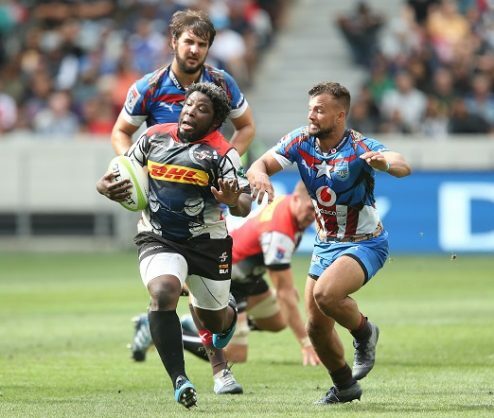 The Stormers and Bulls provided rich entertainment for a 50 000-plus crowd on Sunday’s #SuperHeroSunday climax with a relative feast of attacking rugby. Robbie Fleck’s home side eventually triumphed by 33-28. One of South African rugby’s most mouthwatering potential scenarios is Seabelo Senatla becoming an accomplished player in the fifteen man game. The Blitzbok legend is indeed a gifted player who can, in theory, become one of the most dangerous, rounded wingers on the scene. The 26-year-old spoke confidently about how his first full pre-season has benefited him after a difficult start in the main form of the game and backed that up with a promising showing, which included a try, before going off with a hand injury. The glimpses were enough for anyone to hope this doesn’t derail his renewed enthusiasm and focus. Last year’s defensive woes continued to stalk the Bulls in the first half as they allowed the Stormers to make a flying start. Worryingly, not only did their organisation leave much to be desired but did they also tackle alarmingly half-heartedly. Ironically, the introduction of the backup players in the second half brought a change where the Bulls actually defended quite well. Pote Human and his defence coach Pine Pienaar will hope the “B’s” merely showed that the “A’s” were a bit rusty with the system. The de facto home side were missing a whole host of A-listers who’ll add a lot of class to the team. However, in their absence, the Stormers’ depth showed a lot of determination and pleasing ruthlessness in capitalising on the Bulls’ mistakes. They were outplayed in the second half, especially in conceded a lot of possession, but made sure of their patience and execution when skipper Chris van Zyl dotted down for the winner. When Human sent up an almost whole new team for the second half, it did seem that he wasn’t too preoccupied with the result. But a young, mostly scratch combination delivered a surprisingly composed performance in dominating possession and territory, even if they missed out on a few scoring opportunities. That will certainly encourage Human, who might be able to rotate a bit more in the campaign than he might’ve previously expected. Stormers – Tries: Seabelo Senatla, Josh Stander, SP Marais, Juarno Augustus, Chris van Zyl. Conversions: Marais (3), Damian Willemse. Bulls – Try: Handre Pollard, Ivan van Zyl, Warrick Gelant, Paul Schoeman. Conversions: Pollard (3), Manie Libbok.